According to a new report North America Enterprise Content Management Market (2017-2023), published by KBV Research, the North America Enterprise Content Management Market is expected to register a CAGR of 15.5% during the forecast period (2017-2023). The BFSI market dominated the Mexico Enterprise Content Management Market by Vertical in 2016, and would continue to be a dominant market till 2023; growing at a CAGR of 14.7 % during the forecast period. The Healthcare market is expected to witness a CAGR of 16.7% during (2017 - 2023). Additionally, The Retail market would attain market value of $219.2 million by 2023. The Supply Chain Management market dominated the North America Enterprise Content Management Market by Business Function in 2016, and would continue to be a dominant market till 2023. The Marketing market is expected to witness a CAGR of 17% during (2017 - 2023). Additionally, The Human Resource market is expected to witness a CAGR of 17.5% during (2017 - 2023). 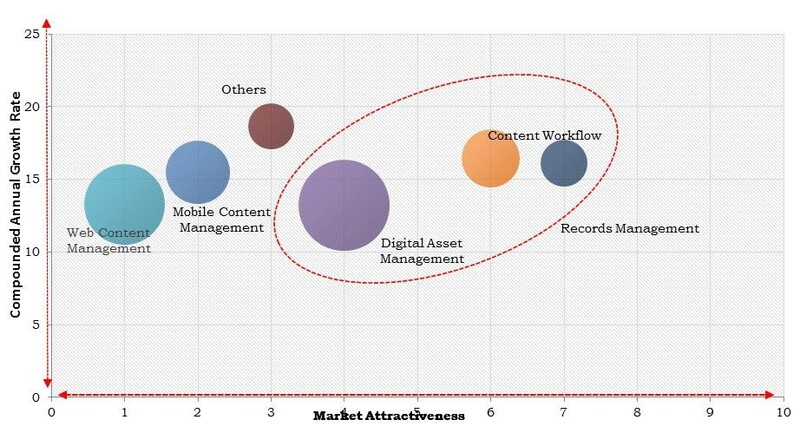 The US market dominated the North America Content Workflow Market by Country in 2016, and would continue to be a dominant market till 2023; growing at a CAGR of 14.3 % during the forecast period. The Canada market is expected to witness a CAGR of 17.7% during (2017 - 2023). Additionally, The Mexico market is expected to witness a CAGR of 16.6% during (2017 - 2023). The report has exhaustive quantitative insights providing a clear picture of the market potential in various segments across the countries in the region. The key influencing factors of the Enterprise Content Management Market in North America have been discussed in the report along with the elaborated company profiles of Adobe Systems Inc., Everteam, Fabasoft, Hyland Software, Inc., IBM Corporation, Laserfiche, Microsoft Corporation, Open Text Corporation, Oracle Corporation, and Xerox Corporation.